The Trump administration may not be friendly to marijuana, but Philadelphia's feminist cannabis entrepreneurs say they're feeling pretty chill. "We're doing things right. We're being compliant. We're getting the correct political officials behind us," said Desiree Ivey, 27, head of Philadelphia's branch of Women Grow, a Lean-In-style networking company focused on empowering women in the cannabis industry. Women Grow is likely the sector's largest professional networking organization. On Friday, the company will participate in a cannabis industry-focused conference hosted at Yale University, a first for American business schools. In, say, California or Colorado, Women Grow members might be able to consume or advertise recreational marijuana. But in Philadelphia, get-togethers are informational only, and generally focus on navigating Pennsylvania's emerging medicinal cannabis market. Early last month, U.S. Attorney General Jeff Sessions rescinded the Cole Memorandum, which under President Barack Obama offered federal protection to cannabis businesses authorized under state laws. But Bridget Hill-Zayat of the Hoban Law Group said that organizations such as Women Grow have little to worry about legally because they generally don't "touch the plant." In 2014, Congress passed the Rohrabacher-Farr amendment, which prevents the Justice Department from interfering with state medical marijuana authorization programs. (This amendment must be renewed every year.) Two years later, Gov. Wolf approved a regulated medical marijuana program for Pennsylvania. The Pennsylvania Department of Health has since approved eight dispensaries, the first of which will open on Thursday. Meanwhile, both New Jersey and Delaware are on the path toward legalization. 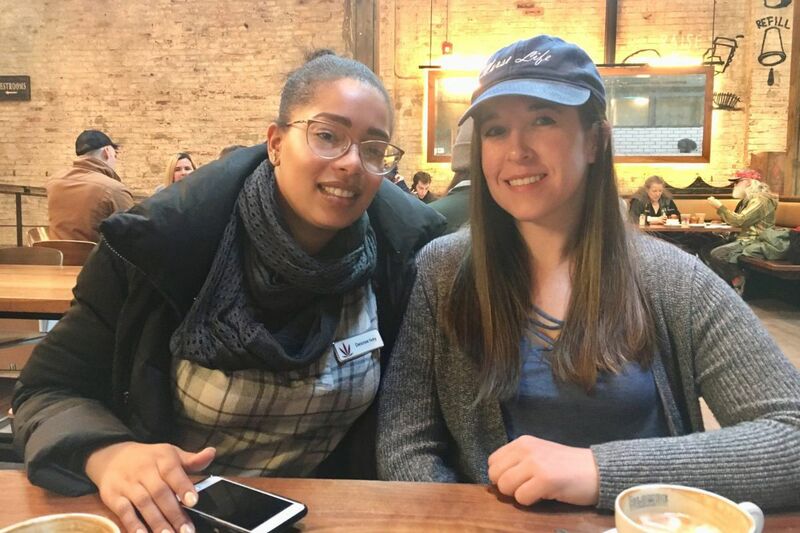 Sitting with two of her group's newest members, Kelly Holl, 26, and Brittany Pitts, 27, of Philadelphia, in La Colombe on Frankford Avenue, Ivey said the newness of the industry provides leadership opportunities for women. "There's no specific narrative here, so [women] can come in and take over," said Ivey, sporting a name tag with a dark magenta cannabis leaf, Women Grow's signature icon. Ivey pointed to an October 2017 study organized by Women Grow with New Frontier Data, which reported that women have a majority ownership in 57 percent of cannabis businesses. Though an August Marijuana Business Journal survey found that only 26 percent of cannabis businesses were founded or owned by women, that number is higher than the average for U.S. businesses across industries. In 2018, the organization says it's also focusing on increasing representation in the industry from people of color and the LGBTQ community, in addition to women. Ivey's entry in the field was born from medicinal need. At 16 she was diagnosed with lupus, news that led her to both the nursing profession and the cannabis industry. Treating her autoimmune disease required extensive medication, and Ivey frequently found herself in doctors' offices and hospitals. Inspired by those who treated her, she eventually became a travel nurse. "It's 12 to 16 hours on your feet [a day], and that can be very hard for someone who has an autoimmune disease," Ivey said. "Your body is attacking yourself, ultimately." When her lupus flared while working in California, a colleague took her to a San Jose dispensary to see if cannabis worked as an alternative treatment. Ivey said she felt a difference "almost instantly." "Just doing micro-dosing of cannabis was just so much better," she said. "My lifestyle just completely changed." Her stamina and energy improved, and the swelling typically associated with lupus subsided. She cut down her prescription steroids by nearly half. Ivey eventually returned to Philadelphia, married and started a family. She now works as a nurse-practitioner and medicinal cannabis nurse. In October last year, she took over Women Grow Philadelphia after signing a licensing agreement with the company's national office. Women Grow expanded quickly after its founding in 2014 in Denver, but has struggled to keep its local chapters (which the company calls "markets") functioning. Today, Ivey's chapter is one of 16. But Philadelphia's branch looks prime to expand under Ivey's command. On social media, especially Instagram, she reaches out to future "CannaMoms" and "CannaBosses," inviting them to join the "growing community." As the head of the Philadelphia branch, Ivey throws networking events for patients, recommending physicians (or those interested in recommending), and representatives of ancillary businesses and dispensaries. Ivey said her first event of the year, hosted at the Pyramid Club on Jan. 11, attracted about 70 people. Speakers included State Sen. Daylin Leach (who supports marijuana legalization) and Ivey's predecessor, Stephanie Thomas, who consults for the cannabis industry. Though female-oriented, Women Grow also attracts male attendees and members. Tickets run between $25 to $40, depending on when you buy (though Ivey sometimes makes exceptions for those who are interested but can't afford her prices). Right now, the Philadelphia chapter has 16 local members who pay $299 a year, and three "Cornerstone Ally Members" who pay $1,000 a year, for special perks. On social media, the local organization boasts 600 Facebook group members and more than 300 on MeetUp. Women Grow has 500 members nationally. Holl, a registered nurse, found Women Grow through Ivey's Instagram account last September. "I've always been a cannabis enthusiast," Holl explained with a smile. Her nursing school curriculum never covered the medicinal benefits of cannabis, but Holl aspires to become a nurse-practitioner, like Ivey, and eventually own a dispensary "where we can use cannabis as a first-line before pills." Women Grow's CEO Kristina Garcia, 36, of Whitehouse Station, N.J., says branches are generally left to direct their own political advocacy. Ivey believes that while cannabis is a for-profit industry, the fight to reform marijuana laws has brought industry leaders together. On Jan. 23, Women Grow Philadelphia, along with the pro-cannabis group PhillyNORML and the ACLU of Pennsylvania, went to Harrisburg. There demonstrators, carrying posters such as "Give The Plant To The People," stood alongside state government officials, demanding statewide decriminalization and legalization. Ivey's February is already busy. She's traveled to Denver for the Women Grow national conference. On Feb. 22, she's to host another networking event with Christiane Campbell, a partner at Duane Morris, LLP with expertise in the cannabis industry. Looking forward, Ivey wants more conditions, such as fibromyalgia and lupus, explicitly added to those 17 that are eligible for a medical marijuana state ID card. She's also planning pop-ups focused on patient education, hoping to reach out to those still in "the Green Closet." "I want to be breaking molds," she said.